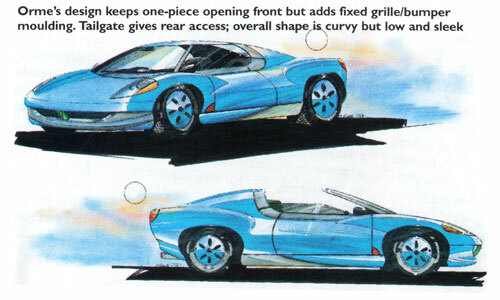 Paul Orme, writing in the May 1997 issue of 'Classic Cars' in an article entitled 'I could have done it better', proposed for his 'redesign' a combination of the 'joys and heritage of the past with the technology of the present' (see pictures above of new GT6, above and Spitfire, below). It would have a fuel-injected front engine combined with rear wheel drive with overdrive as standard. The clamshell bonnet would remain with a low and curved waistline. To read the complete article click here. A couple of readers criticised Paul's design in the next issue, claiming that the illustration looked 'more like a mid-engined car along the lines of the Lotus Elise' with insufficient room for the engine upfront except in transverse form. There was no Mk4 of course, but in 2002 car designer Wayne Westerman called for the resurrection of the British classic, according to the Daily Telegraph. With the industry-wide tendency to boost brand values with retro styling and pastiche versions of classic models, Wayne, as a designer working in the auto industry and the owner of a Triumph GT6 MkII, felt compelled to undertake the project himself. "The GT6, a hard-top, two-litre development of the Spitfire sports car, might at first appear an unlikely choice to revive the Triumph brand; in its seven years of production (1966-73) it was never as popular as the Spitfire, nor was it as spacious as the Stag. However, in its first three iterations, the GT6 offered fun, practical motoring at an affordable price. This is an empty niche in today's market and one a GT6 MkIV would fill perfectly..." To read the complete article click here. Wayne has also done a tutorial on "Rendering with Marker and Airmarker, Introduction". To see this in pdf click here. I don't think Wayne is the same Wayne Westerman who co-founded Fingerworks in the USA. The touch imaging interface they created changed the way people interact with computers by incorporating scrolling, finger tracking and gesture recognition, features found in electronic devices worldwide, including the iPod, iPhone and iPad.